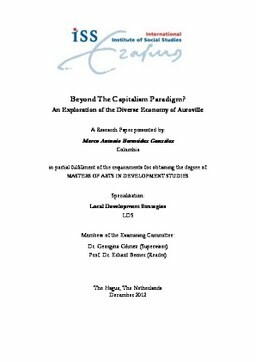 Post-development school states that socio-economic practices at the local level that do not follow a capitalist logic might be the source of a post-capitalist so-cio-economic formation. By the economic principles that it follows, it is pre-sumed that Auroville might be an archetype of a post-capitalist economy. In this paper, following the diverse economy approach, it is determined to what extent profit maximization, as the driving principle of capitalism, is partly or fully replaced by other motivations in this particular case.